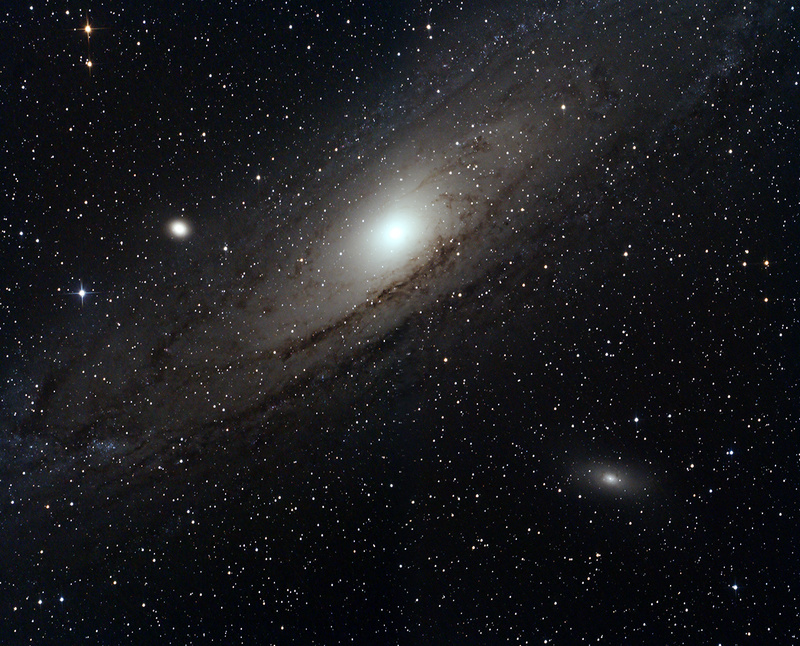 Welcome to the Curdridge telescope observatory astrophotography blog. We explore many aspects of astronomy and astrophotography especially including projects such as telescope mounts. We have a Newtonian reflecting telescope in our budget observatory made from fence panels. Most of our imaging is done using Astrodon narrowband filters and cooled astronomy CCD cameras. Fluxgate magnetometer daily cycle of earth's magnetic field. 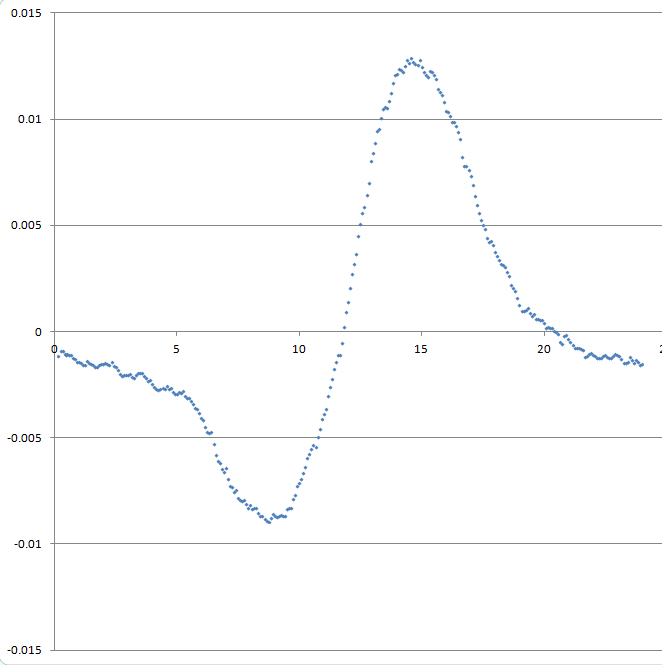 I've started looking at creating an average of the diurnal cycle of the Earth's magnetic field as detected by my FGM-3h fluxgate magnetometer linked up to the Arduino mega in my Earth Magnetic field Observatory. There are a great deal of problems with this due to different errors in the readings, so to start with I've simply taken the average reading on each day. I've used this to calculate the variance from the average at each 5 minute interval during each day, and then averaged all these together. This doesn't get a nice result of the diurnal magnetometer reading cycle - so I've excluded everything outside one standard deviation to remove the outliers and end up with a pretty smooth curve showing the daily cycle where the magnetic field reading from the FGM-3h dips during the morning and spikes during the afternoon. I haven't yet decided if the magnitude of the cycle varies with the seasons - but I'm working on that. Ultimately the goal is to subtract the diurnal variation from the current output to see just the spikes caused by unusual variations in the magnetic field. See here for the live output. Earlier in the summer I purchased an FGM-3h fluxgate magnetometer and rigged it up to the Arduino and a database on the website. Finally I've got around to doing a proper page for it - so click here to see the live magnetometer data. The page allows you select a date period for the data. The magnetometer data allows you to see the changes in the Earth's magnet field during the day caused by the diurnal cycle of the field and more random stuff caused by solar flares etc. The Curdridge Observatory homepage has remained with the same theme it started with in 2002. Various links and bits have been added with little or no plan. The thing was a complete shambles. After my recent revamp of the Recent Images page I decided to copy the theme over to the main homepage. It has gone pretty well, except I don't have it working quite right in IE9. All the web kit browsers, Chrome, Safari etc are fine. Why can't all browsers work the bloody same, eg? It is possible I'll through this design out and change it for something else in a few weeks, but for now at least I have a homepage that I'm not actually embarrassed about! I seem to have been very remiss in updating this blog over the last year. I've also just updated the recent images directory on the site after not touching it for 2 years! The DSLR experiment continues. This time with a mosaic. Each panel of this two-framer of part of the M31 region is made up of about 12 x 300s exposures at ISO800. The Canon 350D DSLR is mounted at prime focus on my 8 inch 1000mm focal length Newtonian telescope. The camera is modified with a higher band-pass IR filter, but no light pollution filters have been used. As you can see I've made a poor job of joining the two sections together. Getting the background colour flat across the whole image is proving troublesome. Because of this I've pushed the background rather too dark, so more processing practice needed! Click here for a larger sized version. 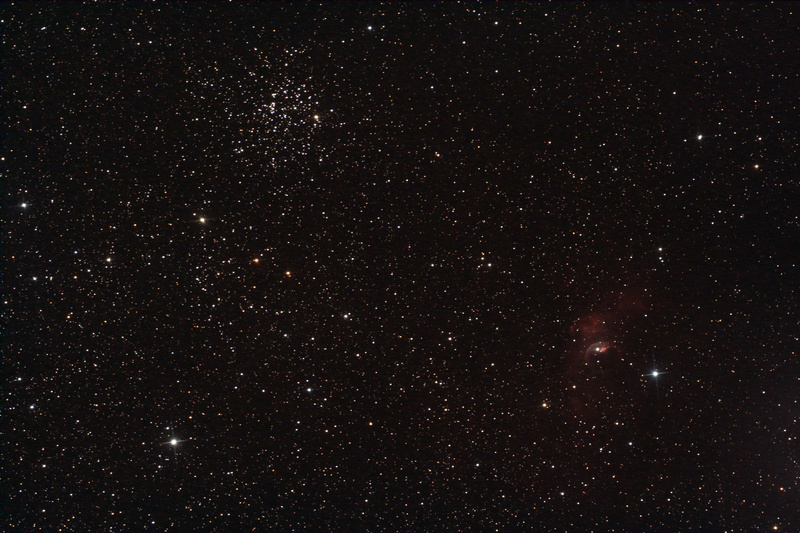 The ongoing experiment with DSLR astrophotography is coming along fairly well. Here is a fairly large integration (about 4 hours exposure) on part of the IC1805 Hear NEbula complex (also known as the Rolling Stones Nebula). After spending so much time hiding behind a hydrogen alpha filter, I've almost forgotten about star colours. The DSLR gives a nice quick route to a full colour image. Of course, they have their drawbacks with noise and so forth, but this this has been a lot of fun. 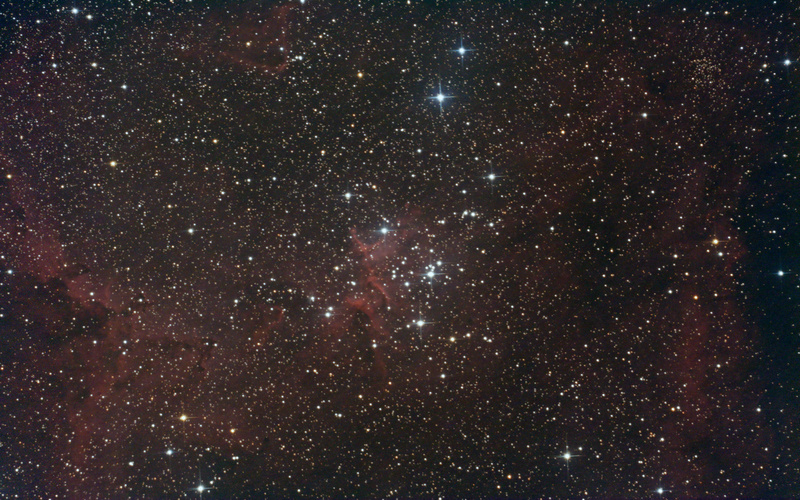 Processing colour DSLR astro photos in photoshop is yet another learning curve I'm struggling with. 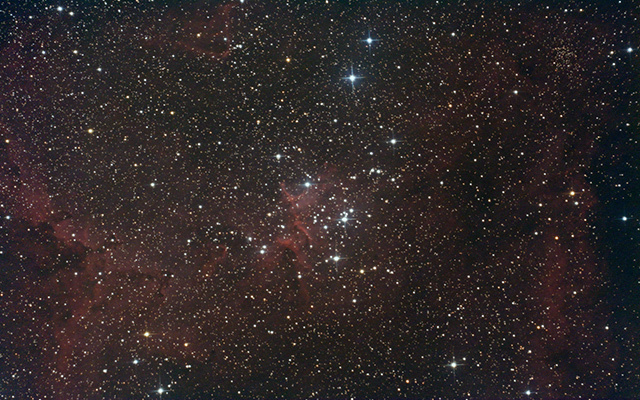 IC1805 Heart Nebula with 8 inch F5 Newtonian and the homemade mount. No filters. Click through for the larger version. Slowly getting the hang of this DSLR astro imaging lark. Lesson from last night: Remember to charge the batteries for the camera!! I'm using 6 x AA rechargeable batteries to run the camera, but I think i forgot to charge them because they ran flat around 12:30 this morning. I didn't change them because I was asleep in bed at the time!! We're trying something new for the Curdridge Observatory: Colour imaging with a Canon DSLR camera! For many years my astrophotography has been dominated by monochrome hydrogen alpha imaging with the odd tri-colour narrowband image thrown in for good measure. I've never seriously used my Canon 350d DSLR on the telescope. Previous explorations of traditional RGB imaging have never come to much: Normally due to the difficulty of flattening 4 different images taken through filters with a mono CCD camera. 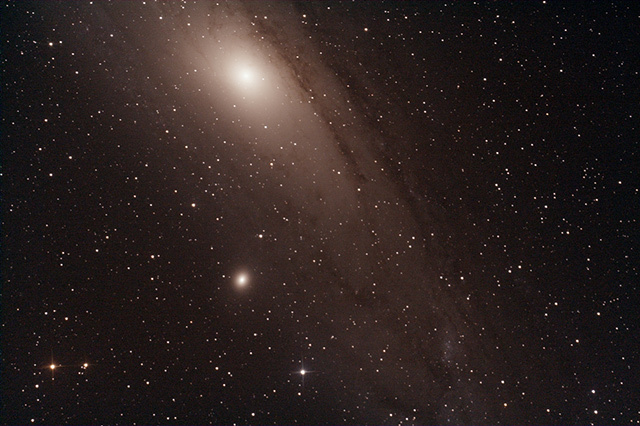 Some recent weekends spent down at the New Forest Observatory playing with Greg's 10 mega-pixel colour CCD cameras have inspired me to see what can be done with my 8 mega-pixel Canon 350d DSLR. Some years ago this digital camera had its internal infra-red filter swapped for the Baader replacement with a view to doing some astrophotography. The occasional dabble aside, I've never really attempted any serious work with it. The goal here isn't to produce any jaw-dropping images. There countless Canon DSLR cameras strapped onto the business end of 8 inch Newtonians out there. It isn't anything new. Think of it more as an exercise in preventing stagnation. Variety to regenerate the soul a bit.. Hopefully I might end up with something to stick on the wall which prints out in a format larger than a postage stamp. Truth be told, I like a new bunch of problems to solve. So how does one do this DSLR Astrophotography business? Step 1: Get your DSLR modified with a replacement internal IR filter that lets light through at common astronomy wavelengths (i.e. Hydrogen Alpha and Sulphur). I'd already done this years ago. Step 2: Attach your DSLR to the telescope. This required a serious bit of hunting around my house to find the Canon-M42-T adapters. Alas, when attached the Baader MPCC the spacing was all wrong. A bit of lathe work soon had the camera attached to the coma corrector with the correct spacing. This then fits the 2 inch focuser on the scope. Step 3: Make the DSLR camera talk to Maxim. Easy enough – The maxim EOS II driver works splendidly and soon I was operating the DSLR camera just like real ccd camera. Step 4: Make your shutter release cable. Cheap serial USB converter and an opto-isolator and that problem was solved. Maxim can now make the camera do long exposures over 30s. Step 5: Figure out the calibration process. Turns out you need nice high value flats and you MUST have bias calibration of the flats. Other than that I found dark frames useful to knock out the amp glow. Dithered guiding via maxim removes most of the hot pixels without a darkframe. Step 6: Power the camera. This was fun. Using the built in rechargeable battery for a night of astrophotography is a bad idea, so first I see a very cheap Canon mains adapter on Amazon. Turns out it has the wrong shaped plug on it. A bit of Cathartic negative feedback results in a replacement that fits and powers the camera. However, this seems to have created a monster earth loop somewhere – turn the DSLR camera on and the telescope mount starts doing random slews - I joke not!!! Resigning myself to using batteries of some sort I buy 6 decent rechargeable AA batteries and a 6 batter holder instead. Step 8: Focus it. FocusMax and Maxim all work together with my ASCOM electric focuser and the DSLR to get a good focus. Slow, but it works. Getting decent focus was one of the horrors that put off DSLR imaging for a long time. Step 9: Find out the collimation is terrible with the larger sensor and phaff about with optical alignment for a few nights. Step 10: Run off 20 x 180s frames and see what you get! After spending a lot of time and energy getting the mini-WASP telescope array up and running at the New Forest Observatory, it was a pleasant change to do some imaging back at the Curdridge Observatory. Last night a brief clear spell gave me time to dust off the homemade GEM telescope mount. Happily everything seemed to be behaving after few weeks of neglect. I was a bit worried the telescope was had got the hump with me running over to play at the NFO. 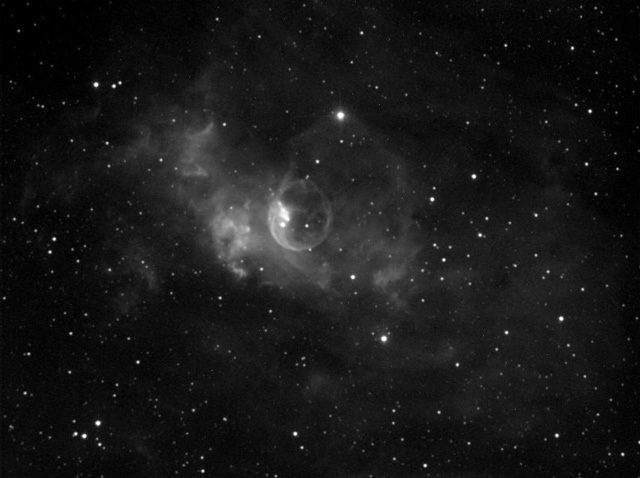 With the clouds starting to come in, I only had time to take 4 x 900s exposures of the very bright Bubble Nebula region with the Hydrogen Alpha filter in place. For a change I decided to let Maxim handle the guiding the DIY mount instead of PHD guiding. Surprisingly it seems to work better than PHD guiding, which was unexpected. Using Maxim to do the guiding opens up the ability to dither the sub exposures a bit to handle the hot pixels and noise. The standard webcam settings in Maxim didn't seem to work for long exposure, but a bit of informed tweaking on my part got it working. 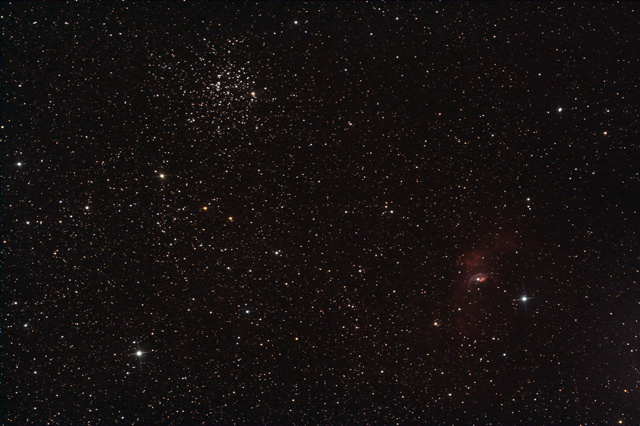 Anyhow, here is the image: Pretty noisy because it is only 1 hour of data, but much better than nothing!